VeriSM™ is a 'service management approach from the organizational level, looking at the end to end view rather than focusing on a single department' . The acronym VeriSM stands for 'Value-driven, Evolving, Responsive, Integrated, Service Management'. 2 How was VeriSM created? 3 What's the VeriSM certification path? 4 What guidance is contained in VeriSM? VeriSM is aligned with the key principles of established service management frameworks and standards such as ITIL®, COBIT® and ISO 20000, but does not seek to replace them. Instead VeriSM aims to provide the 'glue' to bring the different practices together, so organizations can adopt them in a flexible way. These practices may include the traditional ITSM methodologies and also 'progressive practices' like DevOps, Agile, Scrum, Lean, Kanban, etc. that are increasingly applied in the service management domain. VeriSM also recognizes that service management is no longer just for IT, since the delivery of services to customers tends to involve many parts of the organization, such as finance, marketing, manufacturing, sales, legal, logistics etc. 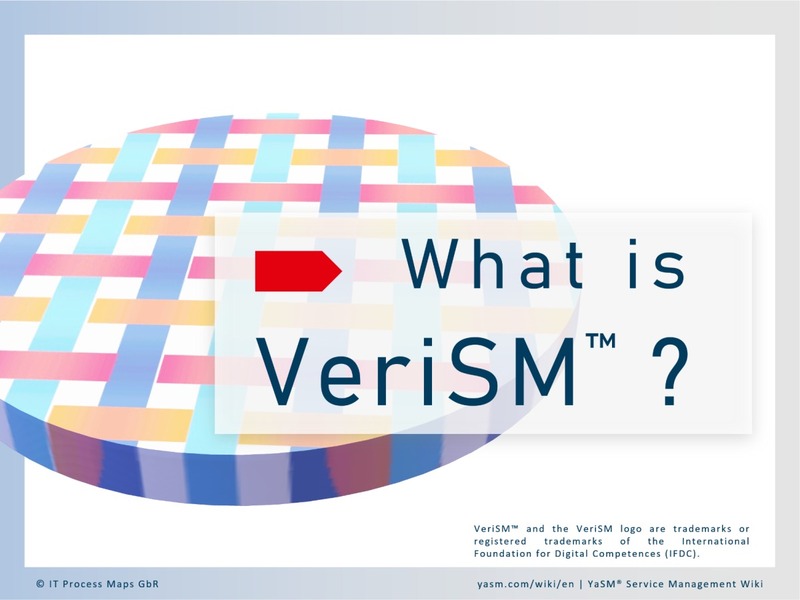 VeriSM service management was launched in 2017 by IFDC (International Foundation for Digital Competencies, a foundation based in the Netherlands). IFDC is a nonprofit organization whose members include several businesses, such as the examination institutes APMG, BCS and EXIN that offer VeriSM certifications. Also among IFDC's members are Van Haren Publishing, the Open Group and itSMF International. The first official VeriSM publication ('VeriSM™ - A service management approach for the digital age' [IFD, 2017]) has been created by an international team of experts from the IT service management community. The VeriSM book was published in December 2017. While the first publication explains the concepts behind VeriSM, the second book ('VeriSM™ Professional', due to be released in Q4 2018) is focused on how to apply the VeriSM approach in the real world. What's the VeriSM certification path? The VeriSM certification scheme provides a modular approach and is comprised of a series of qualifications. The Foundation exam is the entry level certification and consists of two parts: VeriSM Essentials and VeriSM Plus. VeriSM Foundation level exams have been available since January 2018. VeriSM Professional and VeriSM Leader are open to those who have passed the Foundation exam. The VeriSM Professional certification has been available since October 2018 and VeriSM Leader is under development. Since VeriSM is not an official standard, there are no certifications for bussinesses and other organizations. Service providers that wish to demonstrate excellence and good governance in service management may choose to get certified against ISO 20000. What guidance is contained in VeriSM? Part 1 introduces various concepts around services and service management. Part 2 presents the VeriSM model and the VeriSM management mesh. Part 3 provides an overview of progressive management practices and emerging technologies in the domain of service management. The first part of VeriSM introduces essential concepts around services and service management. Part 1 starts with definitions of service management key terms, such as organization, consumer, asset, capability, outcome, service culture, etc. This is followed by a section discussing the impact of digital transformation on service providers and services. New business models and advanced technologies mean increased competitive challenges for service providers, but also opportunities to gain a competitive edge. Technology is often at the heart of these new business models and permeates every part of the organization, which leads to the recognition that service management has to be an organizational capability, not an IT capability. Service providers also need people with the right skills. VeriSM highlights what is necessary for organizations in terms of competencies and teams, touching on topics such as generic competencies, emotional intelligence, ethics, team building and learning paths. Finally, VeriSM discusses common service provider challenges, such as relation management, communication, and organizational change management. Service high level stages: Define, Produce, Provide and Respond. According to VeriSM, governance is a system by which organizations are directed and controlled. Organizations are advised to establish a governance framework that includes, among others, principles, policies, processes, plans and metrics. Principles are typically drawn up for several areas such as security, risk, quality, etc., and then communicated to all staff who are involved in the development and operation of products and services. Once the organizational principles are set, policies, processes, plans and metrics should be defined to translate the principles into detailed guidance. VeriSM, however, does not prescribe specific principles, policies, etc., nor does it give advice about their content. Instead, readers will find summary information of what good governance means for service provider organizations. In addition, there's a section explaining how VeriSM compares with established service management best practice such as ITIL® and ISO 20000. Service providers cannot do business without an understanding of customer requirements. This is why VeriSM starts with the consumer, who provides the requirements for the services to be delivered. Consumers are also at the end of the VeriSM model, where they receive services and provide feedback. In this context, VeriSM describes the relationship with the customer as a critical aspect, and provides some recommendations for the gathering of service requirements. VeriSM introduces the management mesh as a concept providing the flexibility to manage and use various frameworks, standards, methodologies, management principles, philosophies, etc. and management practices used in the organization. VeriSM, however, presents the management mesh as a somewhat vague concept and, for the most part, outlines what are the typical ingredients of the mesh. Building the mesh essentially means selecting the right resources, processes, technologies, management practices etc., in line with the requirements of the organization and the services offered. This concept is in line with the time-tested service lifecycle approach known from other service management frameworks and standards such as ITIL®, COBIT®, CMMI-SVC® and ISO 20000.
as well as the key inputs and outputs. To bring the stage concept to life, organizations are advised to apply their (unique) management mesh and define tailor-made processes for each stage, as required. The last part of VeriSM presents a selection of 'progressive management practices' and emerging technologies that often have their roots in other areas such as manufacturing and software development, and are increasingly applied in the field of service management. The practices covered include Agile, DevOps, SIAM®, Lean, and others. VeriSM encourages organizations to explore various practices, and to adopt whatever methods help them serve their customers better. Each of these practices is a substantial area of knowledge in its own right, so VeriSM can only provide summary information. But readers are offered a good overview of currently popular practices, and for each of them VeriSM explains how they can be applied in the service management domain. IFDC (International Foundation for Digital Competences) (2017). A Service Management Approach for the Digital Age. Zaltbommel, Niederlande: Van Haren Publishing. ISO/IEC 20000® is a registered trademark of ISO. This page was last edited on 28 March 2019, at 19:50.